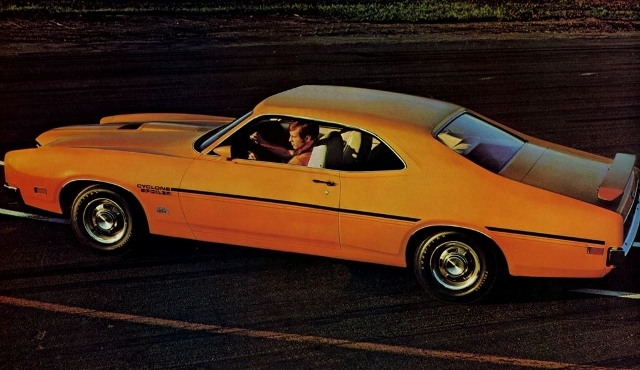 In this edition of Muscle Car Milestones, we’ll travel back in time to when the first 747 took flight, “Planet of the Apes” opens in theaters, and the Intel Corporation is created. Over at the local Mercury dealer, a storm was brewing on the showroom floor. This four-wheeled force of nature threatened to blow away everything in its path. No street or drag strip was safe from its destructive wrath. 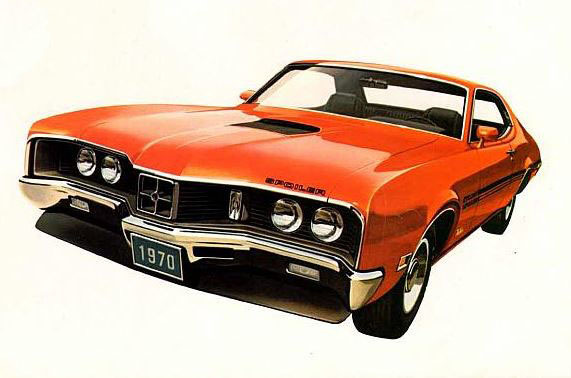 Come with us as we look back at the 1968-1972 Mercury Cyclone. 1968 saw a lot of changes for the Cyclone. It was no longer based on the Comet and shared styling cues and features similar to its Ford Torino stable mate. The Cyclone was available as a coupe or fastback. The base model came standard with a 302-cid V8 with 2-barrel carburetor, 3-speed automatic transmission, and interior amenities such as Ruffino-grain vinyl seat trim and deluxe steering wheel. A larger 390 or 427 V8 engine was also available. The real star of the show was the GT. Built for speed, the GT came standard with stiffer front and rear springs, a large diameter stabilizer bar, and heavy-duty front and rear shocks. Wheels with 5 ½-inch rims, turbine wheel covers, and white sidewall tires were also standard issue for the GT. Engine choices, just like the base model, ranged from the standard 302 V8 all the way up to an available Marauder 390 or 427. A few months after introduction of the 427, it was dropped and replaced with the 428 Cobra Jet. The Cobra Jet was quite formidable out on the strip. It was capable of running from 0 to 60 in 6.2 seconds and could sprint the quarter mile in 13.86 to 14.4 seconds. 1969 was another year of change for the Cyclone. Mercury dropped the coupe and the GT became an appearance package option. The Cyclone still came with a 220 horsepower 302 V8 but a 351 was now available with choice of 2- or 4-barrel carburetor. Buyers who wanted to customize their Cyclone could order the GT appearance group. Items such as a remote-control racing mirror, turbine wheel covers, and fiberglass-belted white sidewall tires came standard with this package. For those wanting a little more pizazz, a tachometer, power front disc brakes, and Traction-Lok differential could be ordered as optional equipment. For drivers desiring a little more gusto, the Cyclone CJ 428 was the way to go. This bold fastback included powerhouse features such as a 335 horsepower engine with a whopping 440 lb. ft. of torque, 4-speed manual transmission, and low-restriction dual exhaust. And no muscle car would be complete without options such as ram air induction, power steering, and choice of high performance axle ratios. In their January 1969 issue, Car and Driver pitted the Cyclone CJ against some of the most notorious muscle machines from 1969. The Cyclone CJ went from 0 to 60 in 5.5 seconds and ran the quarter mile in 13.94 seconds at 100.89 mph. It was slightly faster than the Chevrolet Chevelle SS 396, Dodge Super Bee, and Ford Cobra. Only the Hemi Road Runner was faster by almost half a second. The Cyclone CJ also took top honors in the quarter mile beating the others by a nose with the exception of the Road Runner. The Hemi-powered bird beat the Cyclone by only 0.37 seconds. A NASCAR-inspired version of the Cyclone was also built in 1969. Called the Cyclone Spoiler II, this was Mercury’s entry in the Aero Wars that began in the late 1960s. The Spoiler II was similar to the Ford Torino Talladega and competed out on the track with the Dodge Daytona and Plymouth Superbird. The Spoiler II came in two flavors and was named after two famous drivers. The Dan Gurney Special was painted white with a Presidential Blue roof and the Cale Yarborough Special featured white paint with a Candy Red Apple roof. Both version were powered by a 351 cubic-inch V8 producing 290 horsepower and 290 lb. ft. of torque. At the time, NASCAR rules stated that in order to race on the track, 500 production versions of the car must be built. The number actually built has been disputed but was supposedly between 300 and 500. 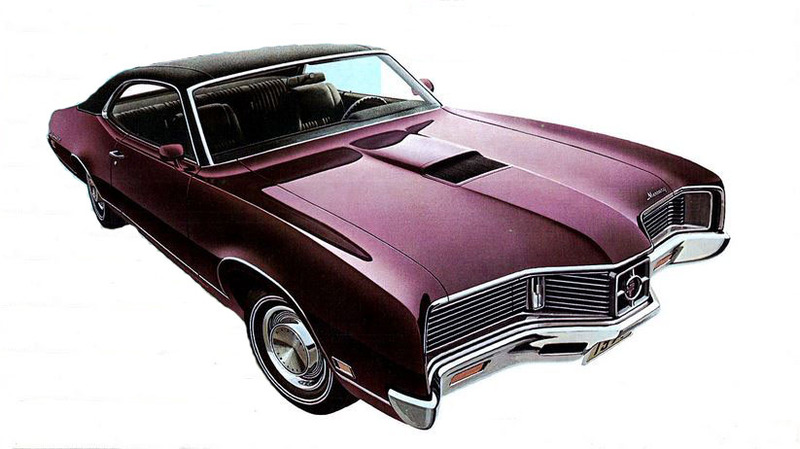 Once again, Mercury shuffled the Cyclone lineup for the 1970 model year. The Cyclone was now available as a base model, GT, and Spoiler. 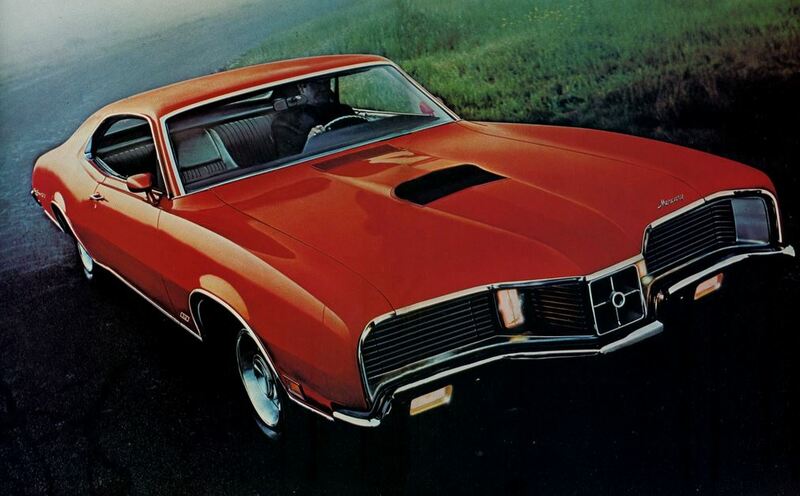 The base model came standard with a 429 cubic-inch 4-barreled V8 with 360 horsepower, 4-speed manual transmission with Hurst shifter, and competition handling package. Drivers wanting something more could order the Cyclone with the 429 Super Cobra Jet along with ram air induction, Traction-Lok or Detroit Locker differential, and Drag Pak. With all these great performance options, it hardly seems fair to call this a “base” model. The GT was the way to go for those wanting a little more flash. The GT came standard with a 250 horsepower 351 cubic-inch V8, 3-speed manual transmission, and competition handling package. Styling cues include an integral hood scoop, concealed headlamps, and dual racing mirrors. For those wanting to turn up the heat on the GTO and Charger, available engines ranged all the way from the 351-4V with 300 horsepower to a 375 horsepower Super Cobra Jet. The street version of the Boss 429 was also available. If you wanted to own the streets, the Cyclone Spoiler is what you drove. That sound you hear coming down the boulevard is the cacophony emanating from the 370 horsepower 429 Cobra Jet engine. This street fighter is also equipped with ram air induction, 4-speed manual with Hurst shifter, and a Traction-Lok differential with 3.50:1 rear axle. Street credibility comes standard as well. Visually, the Spoiler comes outfitted with all the features you’d expect such as a front and rear spoiler, racing stripes, and racing mirrors. If you want more gusto, the 429 Super Cobra Jet and the Boss 429 were available, too. The Drag Pak, Super Drag Pak, and Select-Shift transmission could also be checked off on the option sheet. 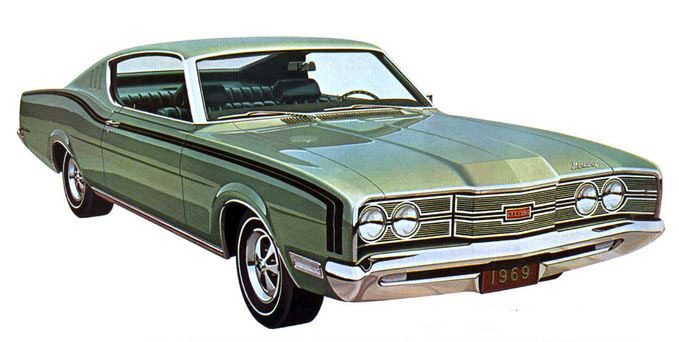 1971 would see the Cyclone become a submodel of the Montego. The Montego Cyclone was available as a base model, GT and Spoiler. All models came standard with a 351 cubic-inch V8, 14-inch wheels, and cross country ride package. Appearance wise, the 1971 Cyclones looked identical to the 1970 models. By 1972, the writing was on the wall. The Cyclone was now an option package for the Montego GT and MX hardtop equipped with the 351 Cobra Jet or 429-4V except Brougham. The package consisted of functional dual hood scoops, choice of manual or automatic transmissions, and Traction-Lok differential. The Cyclone package was not a sales success and was dropped after this year. It was a just a sign of the times. The muscle car was no longer adored by the buying public due to rising gas prices and soaring insurance premiums. Today, seeing a Cyclone is rare and a treat to find at any car show. Here’s hoping you see one of these firestorms at your next car show. Like what you just read? Leave us a comment and let us know what you think. As an owner of two W-nose Cale Yarborough Specials (one in high school in the early 1970’s and one now) my feeling was that it was perhaps the best balanced performance wise and easily one of the most recognizable cars of its era. 351-4V Windsor or not I almost never lost at the stop light grand prix and those few that I did lose to it wasn’t by much and she would easily out-handle and out-stop those that could (essential to doing really ignorant things and hiding from the fuzz!) I treat the one today with much more respect as there are almost none left to represent her breed. Shoot, most people encountered young AND old do not know anything about the Cale cars, of the Cyclone at all nor of the David Pearson/Wood Brother’s win record. She is a labor of love for me as there is no reproduction anything for the body or interior (Torino stuff is not the same, trust me!) but is worth it to remind me when we were both younger running flat-out screaming her song, aerodynamics pinning her securely to the pavement. Cool story about a cool car. Thanks for sharing!